This site is an experiment in “mapping” a digital archive. Mapping the Circle defines mapping as the use of visual tools (graphs and charts) to create another way of looking at archived writings. The purpose of this mapping is to create visual means of comparing data, more specifically, the archived writings of Samson Occom and Eleazar Wheelock in the Dartmouth Occom Circle project. 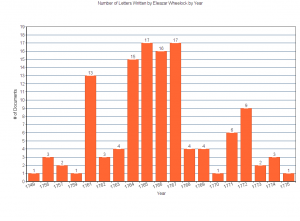 The data used on the cite is taken from the archived letters of the Dartmouth Occom Circle Project. 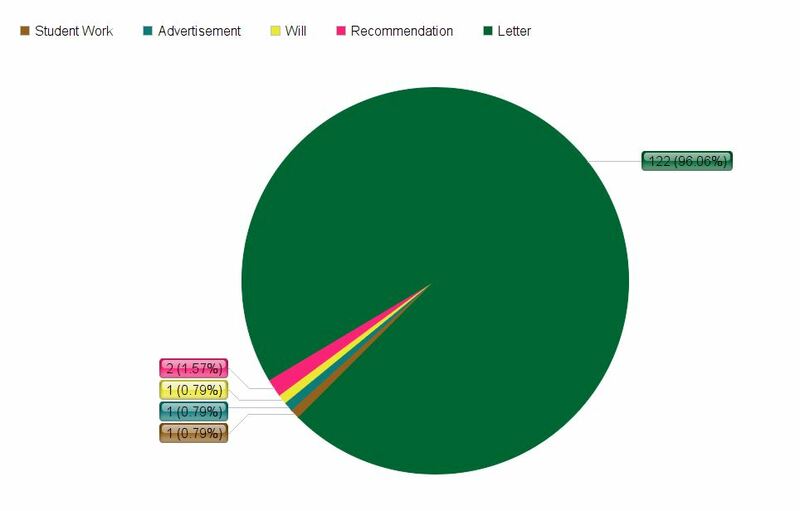 The numbers used are by no means representative of all writings ever done by Occom or Wheelock, simply those archived on the Occom Circle site. What is the Occom Circle? The following is a brief history and description as found on the Occom Circle website. In May 2005, the Dartmouth Alumni Office asked Ivy Schweitzer, professor of English, and Peter Carini, College Archivist, to present some of Occom’s papers to visiting alumni and members of the Mohegan tribe during Dartmouth’s annual pow-wow. Tribal elder Roland Harris, whose daughter graduated from Dartmouth, asked why, if Occom were as important as we claimed, he did not have a larger presence at Dartmouth. It was a good question with a complicated answer. In the 1769 Charter, founder Eleazar Wheelock describes the College’s mission first and foremost as “the education and instruction of youth of the Indian tribes in this land in reading, writing, and all parts of learning …” (http://www.dartmo.com/charter/index.html). Wheelock may have been saying what his overseas donors wanted to hear. Although Native students continued to enroll in small numbers at the College, it was only in 1972 under President John Kemeny that Dartmouth established its Native American Studies Program. 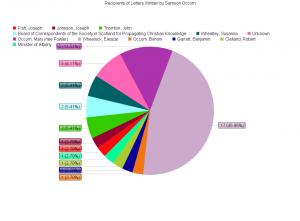 Intrigued and inspired by Harris’s query, Professor Schweitzer determined that a website dedicated to the works of Samson Occom would not only significantly increase Occom’s presence at Dartmouth, but also provide a teaching tool for academic courses, as well as a resource for students, teachers, scholars, alumni, the Mohegan tribe, and other Native Americans. In Fall of 2006, she applied for and received a one term Fellowship from the Dartmouth Center for the Advancement of Learning (DCAL http://www.dartmouth.edu/~dcal/) and over the next year––with a team comprised of the College Archivist, a website designer from Curricular Computing, a specialist in TEI markup, the librarian in charge of informational technology, and several student assistants––produced a prototype website. The team showed this prototype to a group of scholars and potential users, including Mohegan tribe linguist Stephanie Fielding and faculty in Dartmouth’s Native American Studies Program, in order to get feedback and flesh out the direction and parameters of the projected website. In 2010, Professor Schweitzer applied for and received a grant from the National Endowment for the Humanities to create a Scholarly Digital Edition of the Occom materials; work began on the site in January 2011. Especially fitting is that The Occom Circle was awarded a “We the People” grant, a special initiative for projects that “explore significant events and themes in our nation’s history and culture” (wethepeople.gov/grants/). “Project History.” The Occom Circle. Dartmouth College. 2014. Web. 03 March 2016. “Project Description.” The Occom Circle. Dartmouth College. 2014. Web. 03 March 2016. This entry was posted in About on March 7, 2016 by Angela Noppenberger. 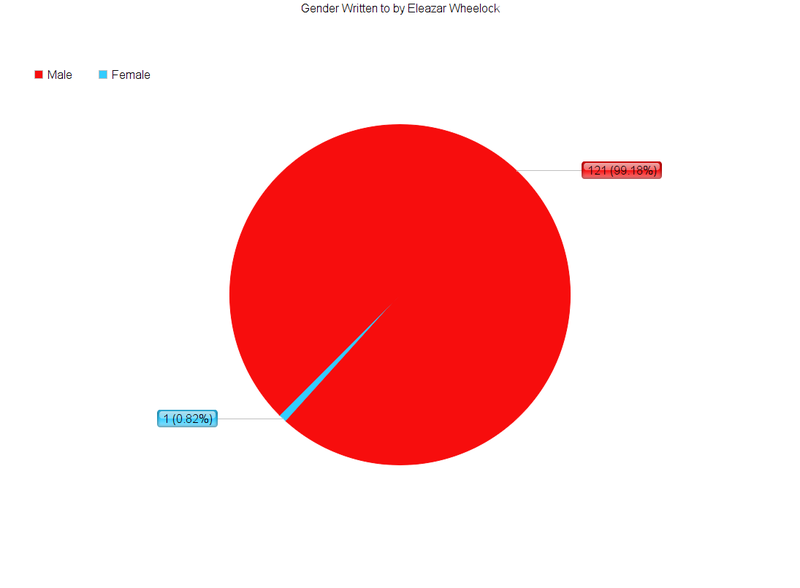 Graphing the percentage of letters written to males and females in the transcribed letters of Eleazar Wheelock in the Occom Circle project. This entry was posted in Eleazar Wheelock and tagged Gender, Letter Recipients, Letters on March 7, 2016 by Angela Noppenberger. Graphing the percentage of letters written to males and females in the transcribed letters of Samson Occom in the Occom Circle project. 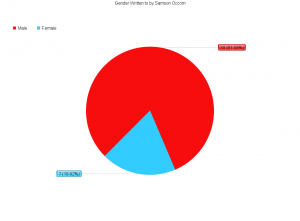 This entry was posted in Samson Occom and tagged Gender, Letter Recipients, Letters on March 7, 2016 by Angela Noppenberger. 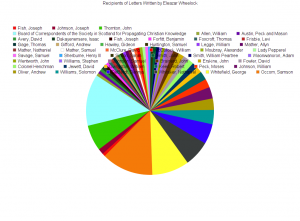 Charting the recipients of letters by Eleazor Wheelock transcribed in the Occom Circle Project. This entry was posted in Eleazar Wheelock and tagged Letter Recipients, Letters on March 7, 2016 by Angela Noppenberger. 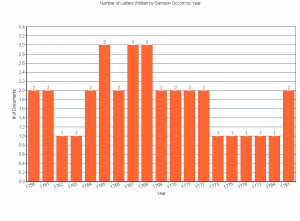 Charting the recipients of letters by Samson Occom transcribed in the Occom Circle Project. This entry was posted in Samson Occom and tagged Letter Recipients, Letters on March 7, 2016 by Angela Noppenberger. This graph shows the number of transcribed letters written by Eleazar Wheelock in the Occom Circle project by year. This entry was posted in Eleazar Wheelock and tagged By Year, Letters, Letters by Year on March 7, 2016 by Angela Noppenberger. This graph shows the number of transcribed letters written by Samson Occom in the Occom Circle project by year. This entry was posted in Samson Occom and tagged By Year, Letters, Letters by Year on March 7, 2016 by Angela Noppenberger. This graph shows the number of transcribed documents written by Eleazar Wheelock in the Occom Circle project by year. This entry was posted in Eleazar Wheelock and tagged By Year, Documents by Year on March 7, 2016 by Angela Noppenberger. 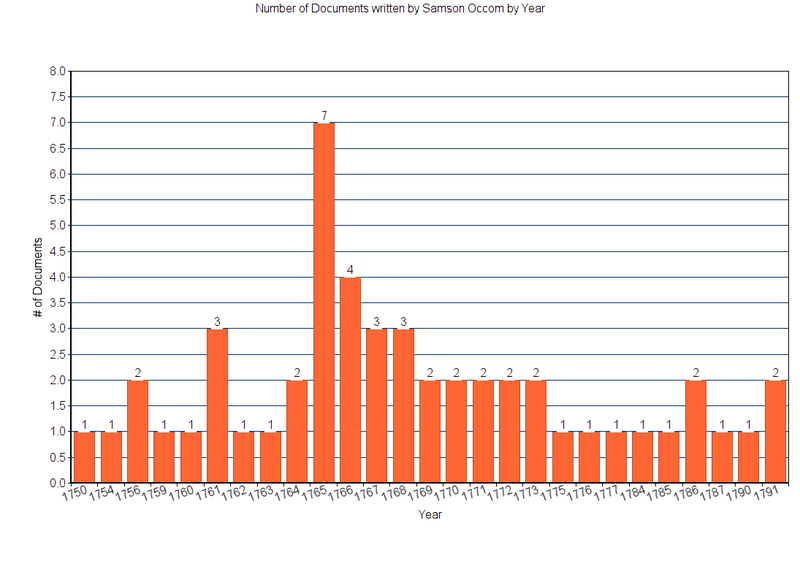 This graph shows the number of transcribed documents written by Samson Occom in the Occom Circle project by year. 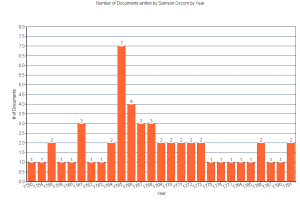 This entry was posted in Samson Occom and tagged By Year, Documents by Year on March 7, 2016 by Angela Noppenberger. This graph breaks down all transcribed documents written by Samson Occom in the Occom Circle project by type of document. This entry was posted in Eleazar Wheelock and tagged Type of Document on March 7, 2016 by Angela Noppenberger.